Dolls, for ages I have longed for the chance to be bright and bold in terms of my outerwear. To stop traffic with the color of my coat; to turn heads with the ostentatious hue burning clearly across the Seven Seas; to be the speck of color spotting the stark white snow enveloping me in all of its pristine prettiness. Of course, I did not always feel this way. There was a point in time when I wanted nothing more than to blend in with the crowd; to embrace commonly colored navy blue, winter white, and ebony shaded coats that would stand the test of time and make me one with the bland outerwear donning world. Blair Waldorf changed all that. Since seeing her styled in a ravishing ruby red coat seasons ago on Gossip Girl I have searched high and low for the perfect crimson piece to add to my wardrobe; Burberry’s Short Hooded Toggle Coat seems to be it. Yes my loves, I am aware of the fact that Ms. Waldorf’s sassy scarlet sheath was quite a bit more feminine in its aesthetic and length, swishing seductively about her legs as she glided daintily from one New York City hot spot to another; but it is the slightly militant design of Burberry’s cropped beauty which puts it in a class all its own. The heavyweight wool retains the ability to keep one warm in any potential blustery situation; while the zip closure, toggle fly, and multitude of flap pockets, all sporting shiny black double-button closures, add a dash of highfalutin decadence to the architecture which keeps you looking polished at all times. But the true piece de resistance of the Short Hooded Toggle Coat is the signature Burberry checked plaid lining the inside, and, my personal favorite, the hood – an ambrosial inclusion which makes it easy for one to channel their inner Little Red Riding Hood. But alas; all fairytale musings must wait, for, while a seemingly ideal addition to one’s wardrobe, the Burberry Short Hooded Toggle Coat seemingly lacks one very important thing…a price tag fit for the budget fashionista. At $895.00, Burberry’s beauty is nothing but a far off dream; hence the reason I have set my sights on Forever 21’s Toggle Fleece Coat. Darlings it may lack the pretty plaid lining of the Burberry, but for a mere $29.80, that’s simply a sacrifice I have no qualms about making! Thanks to Bluefly and Forever 21 for the pictures. Don't forget to enter The Haute Hostess Giveaway for your chance to win a Women’s Apron Original Frosted Cupcake from Flirty Aprons. Kitty cats, the lovely ladies over at HiFashion have just opened up a shop full of stunning pieces to choose from. Now through Sunday, February 14, 2010, quote HF21 and receive a discount on any and all purchases. Happy shopping! To answer your question, it's actually my father's AmEx that will take a beating with a splurge today! I know, it sounds horrible... but I was promised to buy myself a little birthday gift since my family is overseas and can't celebrate with me in person. Maybe I should head over to Burberry - that coat is awfully cute and I really like the crop! I'm sure we all have a myriad of knee-long coats in our closets already - I know for sure sure I don't need another one! Love the coat, it looks fantastic! Thanks for dropping a line on my blog, love to hear from you. If you are keen to exchange links, please give me a shout! I'd love to exchange links with you. I like this coat - I've been meaning to get myself a brightly coloured winter coat for aaages but just never got round to it. Next year though, I'm definitely going to be wearing something bright and beautiful like this. Love ittt. 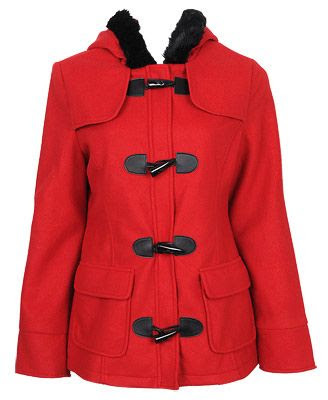 I have always wanted a gorgeous red coat, so chic! And such a great way to add a little wow to an outfit. I will have to check out the Burberry version, I am sure it is worth the splurge! Thank you so much for visiting my blog and leaving such a nice comment. I just love your blog, a daily visit for me! Love the jacket, though I'm still in the neutral mindset for coats. I love the combination of a black pea coat and a bright aqua scarf or something to that effect! 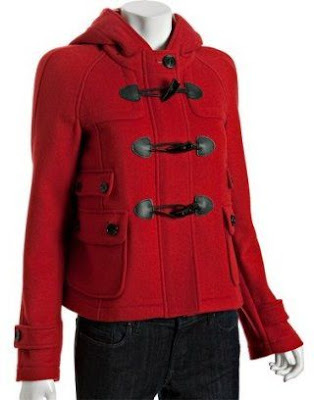 Though for thirty dollars, it might be worth while to experiment with a red coat! Erika, I tried that on at F21 yesterday and it looks superb. Great deal for the price. I was Little Red Riding Hood in a kindergarten play once. Need some advice--can you still wear black boots and tights with short skirts in February, or is it too fallish? Anything red and warm--YES! You must get it!! I love red in winter jackets. I bought my daughter a red p-coat by Guess, no toggles though. But very stylin'. The F21 jacket looks like (if it were a bit longer) something a Russian Emperess might wear. Sigh. the forever21 it's a better choice! I think a bright coat is essential for everyone. Its such a perfect thing to brighten up cold, dark days. I definitely prefer the Forever21 one. These beautiful coats remind me of walks to school, swinging my lunchbox with pigtails in my hair and buckles on my shoes! I've never owned a toggle coat in my adult life and now I'm wondering why! I think this is the first time I'm going to go with the splurge. It just seems so classic and trim ... and I don't like the faux-fur trimming on the collar of the F21 one. Great finds, though :) Now you've got me wanting to unleash my colourful side, all my coats are so boring haha. this is cute ! its definitely something different for burberry. ps - dooo the sparkly bra =) you wont regret it. it looks great with so many things. This is so cute my dear Erika ! That Burberry coat is stunning, but count on Forever 21 to always have what you're looking for at an unbelievable price. Love it!! Very pretty. I love the red and the toggles. What wonderful coats! Red is a great choice for coats, as it can go with both black and brown shoes. Have a lovely weekend, doll! These coats are so beautiful! And in the wintertime, I always wish I had something color. A little color always puts me in the right mood. Though to be honest, I really can't wait for the springtime. I love daylight, so I'm really glad the days are getting longer again. hi darling. thanks so much for that warming kind comment! youre so nice! i really like vampire weekend. and cant wait for the new record! have you heard it? im waiting for it to come up on spotify..
Oooooh, I'm in love with the red!! My favorite color by far! Love the substitute that you've found! Isn't it so frustrating how price tags can get in the way of having a fabulous wardrobe?! But the alternative you found is fabulous! Love the red! I have forever been dreaming of a classic Burberry trench - one day, one day! Thanks SO much for your lovely comments honey, you always make me smile and brighten my day. Hope you have a heavenly weekend! How did you know I am on the hunt for a short, but bright coat? :) Too perfect... I want it right now! forever 21 is where it is at! RYC: I heard Leighton Meester's version when it first hit youtube, but I'm not much of a fan. Gwyneth Paltrow seems perfect for that song. Ooooh super cute!! Gotta love F21! Nice find. i think you found a good copycat jacket for a good price but i am in love with the burberry. mmhmm...it's beautious. Erika ... I need funds to get that sublime Burberry Toggle Coat you just featured ... Waaah! I love the Burberry coat so much! I wore a gorgeous red coat around university for four years...and now I get messages from the friends I graduated with telling me, "I saw someone in a red coat and it reminded me of you!" A signature piece may be worth a large price tag, but this was is super steep. Oh my gosh darling, that is such a fantastic coat and for such a steal, I must buy it immediately! BTW, you've been tagged for an award on my blog dearest!!! As a kid I had a red coat I named "little red riding" and that burberry would be a big upgrade! GORGEOUS jackets, love them both! Great bargain find...especially because my budget does not allow for such splurges these days, and the cheaper one looks great! I hope you have a fantastic weekend, Darling! Such a charming coat! So perfect for Spring! if my visa was so pitifully maxed out i would be logging online to buy that f21 toggle coat RIGHT AWAY! that is a pretty darn good alternative!